CHICAGO (WLS) -- A new reward is being offered in the brutal murder of a 15-year-old from the West Side. 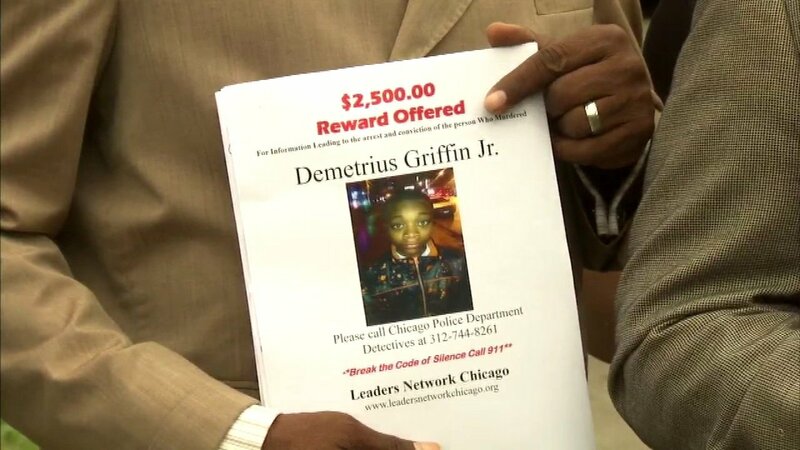 What happened to Demetrius Griffin Jr. has shaken an entire community. While they are calling for an end to the violence, the one thing they said they need right now is just one phone call. "We're here today because we're completely appalled at this despicable, atrocious and barbaric manner in which one of son's life was taken," Rev. Ira Acree, Greater St. John Bible Church, said. On Friday, faith and community leaders stood together on the West Side calling the murder of Griffin a new low. "I've talked to many of colleagues, people in the city, it sends chills, just imagine what that family is feeling," Alderman Emma Mitts, 37th ward, said. Demetrius was a freshman at Steinmetz College Prep. He was described as a gentle kid who always followed his curfew. So when he didn't come home last weekend, his family knew something was wrong. His body was discovered in an alley, in a recycling bin, burned beyond recognition. "Community I need your help they killed my baby out here in this alley, I need somebody, you know something, please come forward, they took my life," Polly Sykes, the victim's mother, said. The same plea echoed Friday afternoon by the Leaders Network, a social justice group based on the West Side standing near the alley where Demetrius' body was found, offering a $2,500 reward. They said they just need one phone call. "Wherever these individuals are, they're being housed, someone is providing shelter, they're eating, they must be exposed. This is a cancer in our community," Bishop Travis Grant, Antioch Network of Churches and Ministries, said. "Speak up for Demetrius because it's Demetrius now, it could be your son, your nephew next time," Grant said. Right after speaking to reporters, they went door to door passing out the flyer. They want those responsible off the streets and they said the only way to that is for someone in the community to speak up.